We sell our blackberries by the gallon, from 1 Gallon, 5 Gallon, 10 Gallon and on. Prices drop for larger amounts, so the more you buy, the better the deal! If you want to know our pricing, please give us a call at 662-538-2899, or through our contact page. We welcome U-Pickers to our farm! The berry picking at Hays Berry Farms is first-come, first-served. 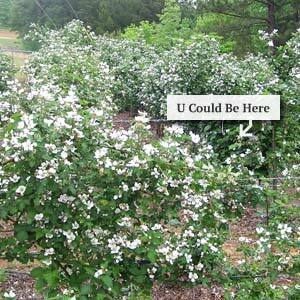 We will show you an area to pick berries, but if you want to go to another area to pick, feel free to do so. We don’t mind you picking anywhere on the farm. We sell berries by the gallon instead of by the pound. We provide 1 gallon buckets for the use of the pickers, and after you pick all you want, we will transfer the berries into other containers for you. We WILL NOT allow our plants to be damaged by U-Pickers. Whether it is breaking the vines or cutting so the berries can be reached easier, we will ask you to leave immediately if we see you damaging our plants in this way. We always welcome small children on our farm to participate in the experience of picking their own fruits and vegetables. Even though we do not have ants or other pests that can hurt a person, or holes from burrowing animals, we do have honey bees. So we ask that you keep your children with you, and keep an eye on them at all times. Dogs are not allowed onto our farm due to the fact that some of our family members cannot be around them. Our goal is to provide fresh fruits and vegetables that are chemical free. We do not use any insecticides anywhere on our farm. ALSO, Any law enforcement agency personnel will get 1/2 price on all fruits and vegetables when bought from farm only not at farmers markets. It is our farms way of showing appreciation and support for them.